While Captain John Smith was a prisoner among the Indians of Powhatan's tribe, he made the acquaintance of that chief's daughter, Pocahontas [po-ka-hon'-tas], a little girl of ten or twelve years of age, with whom he was very much pleased. 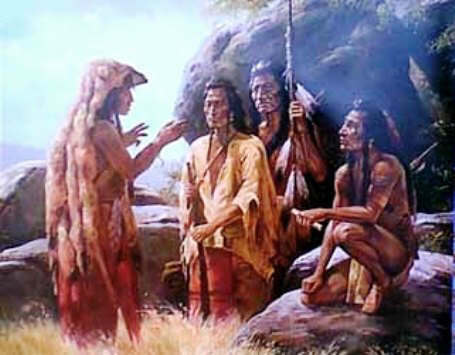 Years afterwards, he said that Powhatan had at one time determined to put him to death; but when Captain Smith's head was laid upon some stones, and Indians stood ready to beat out his brains, Pocahontas laid her head on his, so that they could not kill Captain Smith without striking her; seeing which, Powhatan let him live. Captain Smith said nothing about this occurrence in the first accounts of his captivity, and many people think that it never happened.